With Rezku POS you have a powerful merge feature that allows you to combine two separate orders into one. Depending on the sequence you perform the merge, you will experience different results. It’s important to understand how order merging works to get the result you’re after. Essentially, the resulting merged ticket will take on the characteristics of the open order and add the items from the order you choose to merge with it. ● Two orders without seats when merged together create a single order without seats. 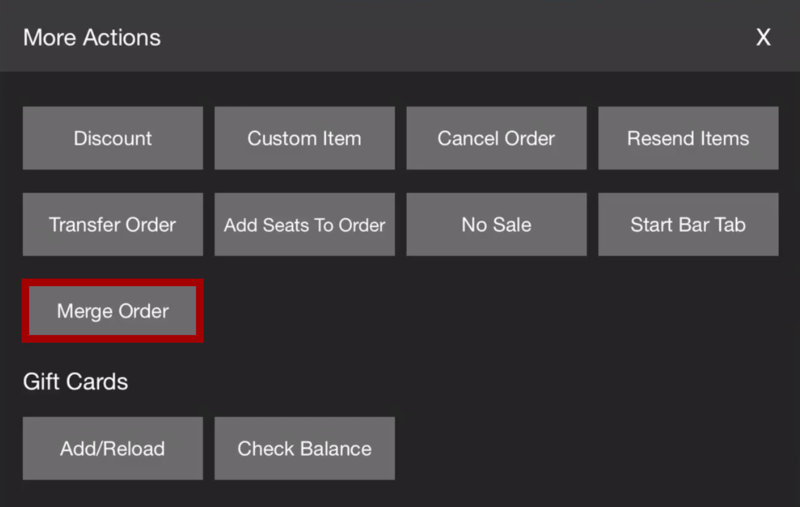 ● From the New Order screen start an order, then tap the Hold button to save the order to the Ticket screen. ● To merge these two orders, tap the More button. 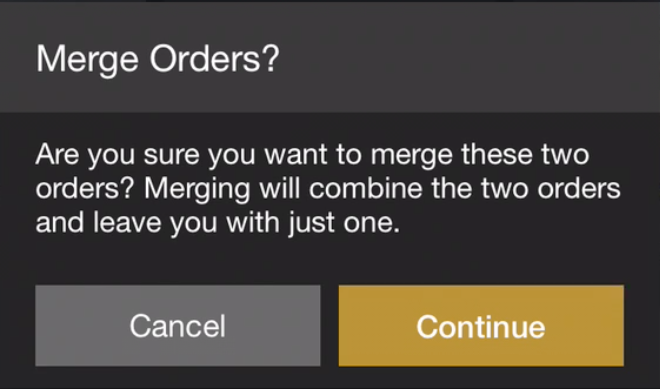 ● Choose Merge Order from the popup window. ● In the ticket window that appears, choose the order with items you want to come into your current ticket. ● Tap Continue to confirm that you want to merge the items from the chosen ticket into the open order. ● You now see the combined order in the New Order screen and you can proceed to the checkout steps with all the items on a single ticket. ● Start with an order that does not use seats. ● Follow the same steps above for a basic merge. ● If you have an open order without seats and you choose to merge it with an order that has seats the seats will not come over, only the items will. - The seat numbers will be removed. ● If the order you choose to merge does not have seat numbers enabled, the items from the order without seats will appear together at the bottom of the order on an additional seat. ● You’ll be asked if you want to keep the same number of seats or add additional seats. - If you keep the same number of seats, the items from the merge will be added under the same seat number they were on in the original order. * This method is especially useful if you accidentally start a new order between courses for the same table and want to combine the guest’s order (for example, their drinks and entrees are on two orders). - If you choose the option to add additional seats, the items from the other order will appear on new seats below the first set of seats. * This method is used if two parties push their tables together or parties who start dining separately move to a table together. ● When choosing to merge another order into your open order, keep in mind that only the items move. The service type of your starting ticket will not change. 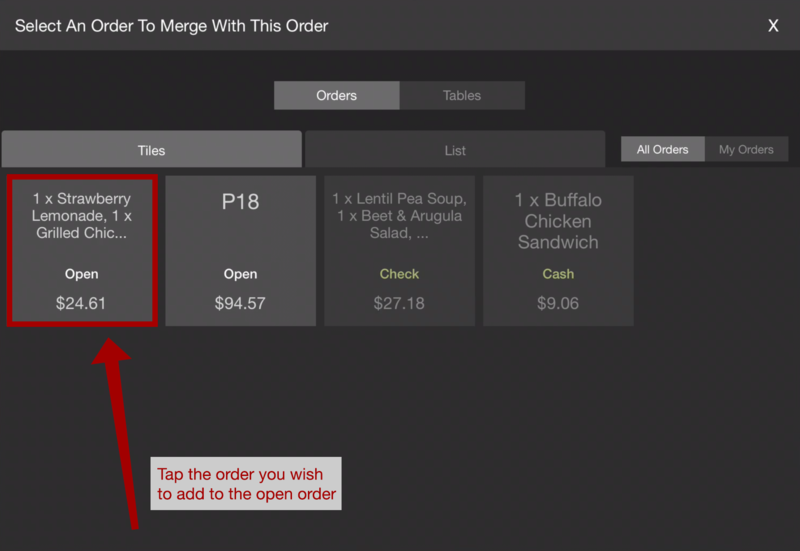 ● This is especially important when merging a bar order into a table order. - Make sure you don’t merge the Table order into the Bar order or you’ll lose your table number and seats. The service type will also be “Bar”. 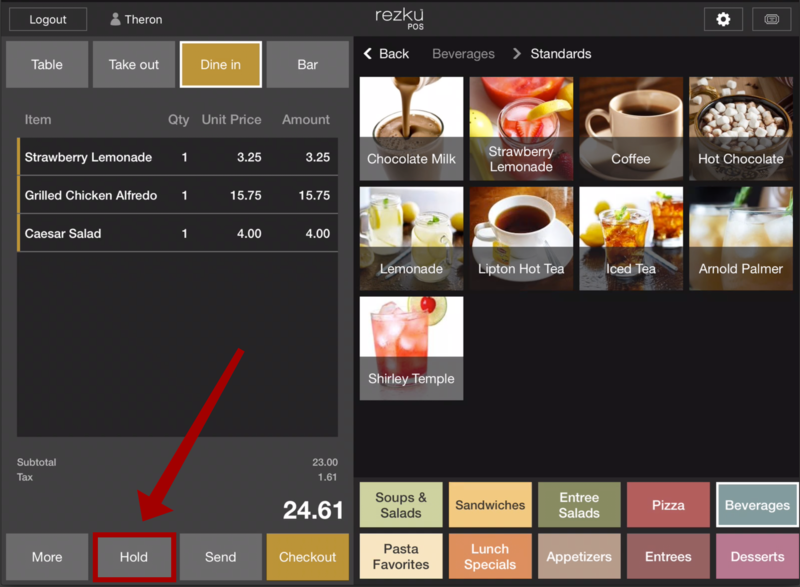 - Instead, make sure the Table order is open to start, tap to merge the bar items into the order. * Move the guest’s drinks to the seats they are sitting at. 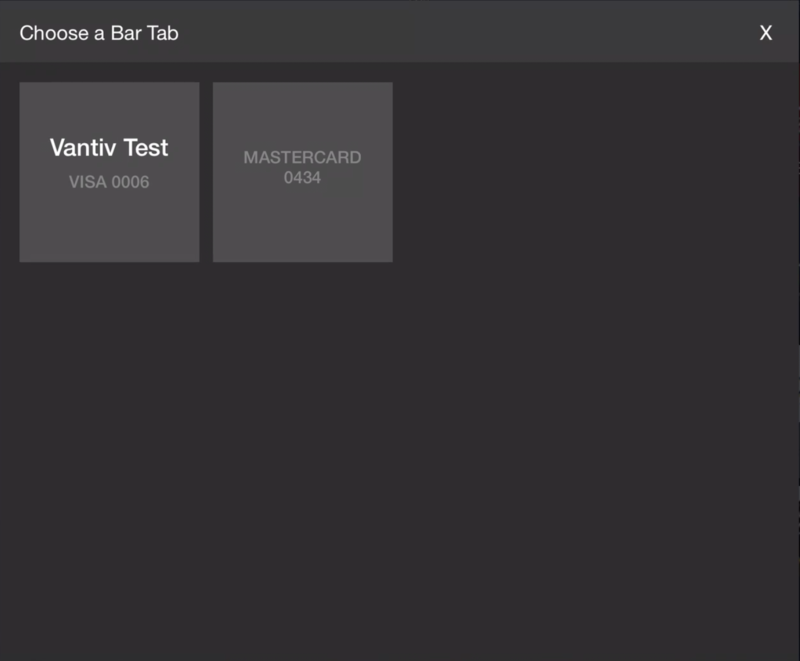 ● If you merge an order without a bar tab with an order that has a bar tab opened when in Checkout, the option to charge the entire order to the tab will appear. 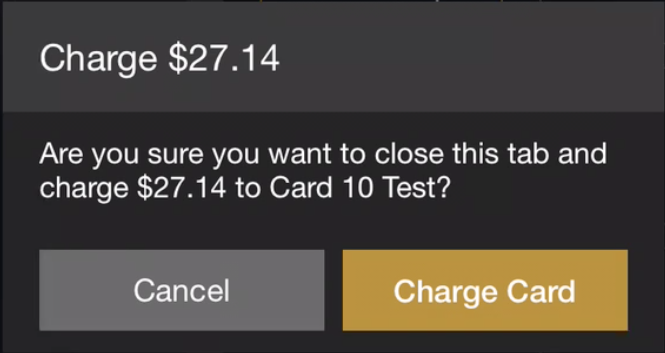 - If you’d like to charge the order to the open tab tap the B ar Tab button for the payment type. - The cardholder’s name will appear in the confirmation box. * Keep this in mind, and be sure that you’re charging the right person's card, the person paying may not be the one who opened the tab! 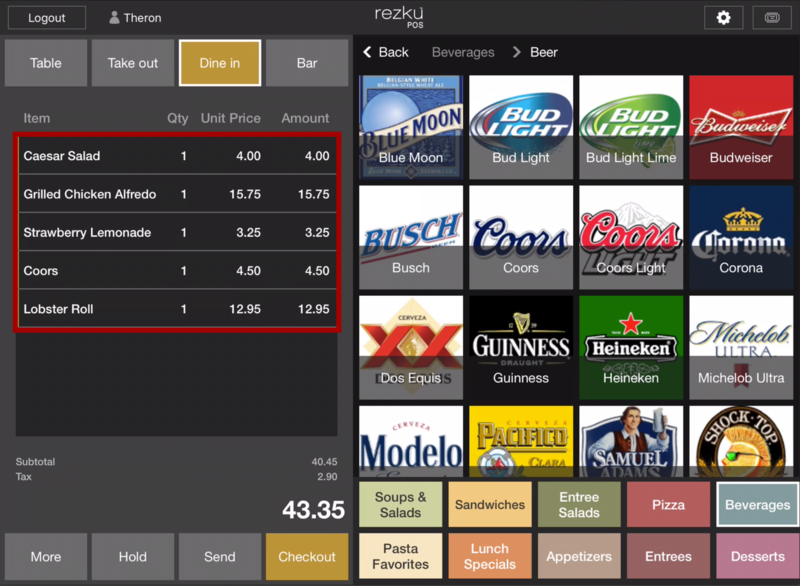 ● If you merge two orders with bar tabs you will be shown a choice of which tab to use for the combined order. ● You can not merge any order that has already been paid or a has any partial payment or paid splits associated with it. ● You can not take a split from one order and move it to another order you can only merge entire orders. ● You can’t un-merge after merging. ● You can’t merge more than one ticket at a time but you can keep merging additional tickets together.